Whilst the adoption by countries of the various standards and guidelines developed by Codex is theoretically optional, the creation of the World Trade Organization (WTO) on 1 January 1995 essentially changed their international status, in that they are now increasingly used by the WTO as the benchmark in the adjudication of international trade disputes involving foods. 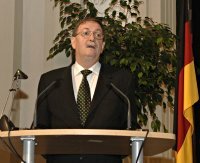 As such, the potential threat of becoming involved in - and losing - such a dispute now effectively makes the adoption of Codex guidelines and standards mandatory, in that it leaves WTO member countries little or no option but to comply with them. 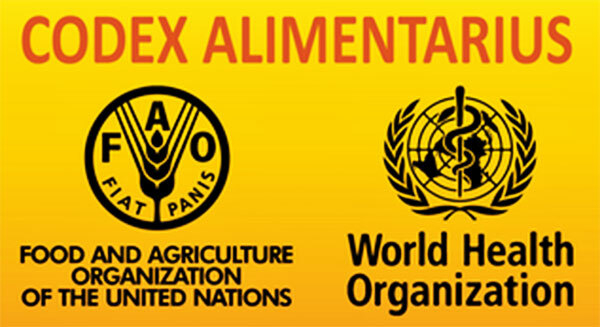 Given therefore that a total of 149 countries are currently members of the WTO, and also that Codex standards or guidelines now exist for virtually every food one can name, this effectively means that the activities of Codex now directly affect the vast majority of people on the planet. 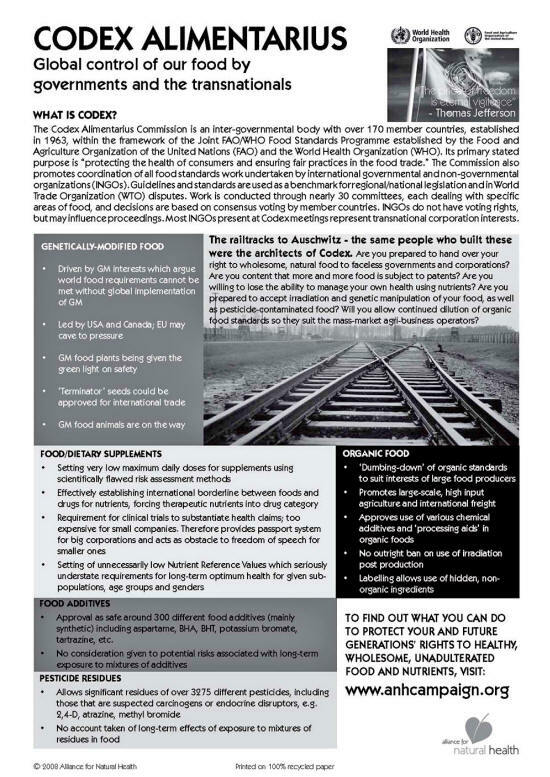 Drafted using the European Union's restrictive Food Supplements Directive as a blueprint, the Guidelines mandate the setting of restrictive upper limits on the dosages of vitamins and minerals, and the prohibiting of claims that vitamin and mineral supplements are suitable for use in the prevention, alleviation, treatment or cure of disease. 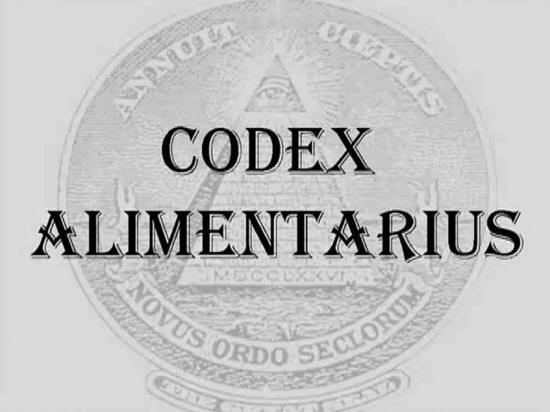 There are already several Codex texts in existence that place restrictions upon the health benefits that can be attributed to food products, and perhaps the most significant of these is the Codex General Guidelines on Claims. 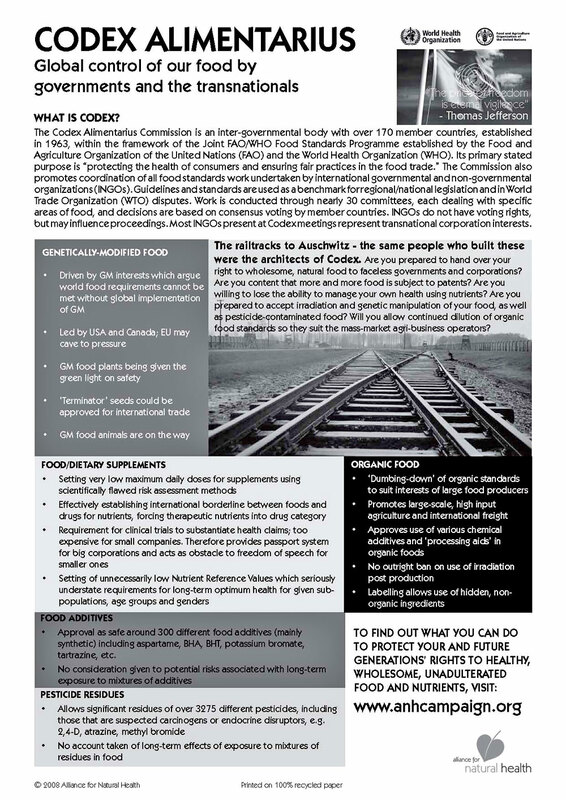 Adopted in 1979, and revised in 1991, these guidelines are in some senses the very root of the Codex problem - in terms of placing severe restrictions upon natural forms of healthcare - in that they effectively seek to ensure that the only products that can make claims relating to the prevention, alleviation, treatment, and cure of disease are pharmaceutical drugs. 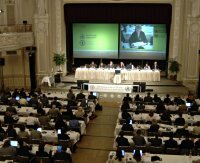 Worse still, however, the Codex Alimentarius Commission recently gave the go-ahead for work to begin on the inclusion of ethylene in the Codex Guidelines for the Production, Processing, Labeling and Marketing of Organically Produced Foods. On a basic level it is simply because organic foods fetch higher prices than ordinary, non-organic, foods, and that as such the large non-organic food producers see an easy opportunity to break into the market for organic foods and make larger profits. On a deeper level, however, organic foods promote better health than non-organic foods, by virtue of the fact that they contain higher levels of micronutrients. The Codex Alimentarius Commission adopted its first guidelines and principles for genetically-modified (GM) foods in 2003. These texts subsequently became instrumental in the United States, Canada and Argentina launching, and winning, a trade dispute at the WTO against the European Union (EU), where it was argued that the EU had been applying a moratorium on the approval and importation of foods containing GM material. 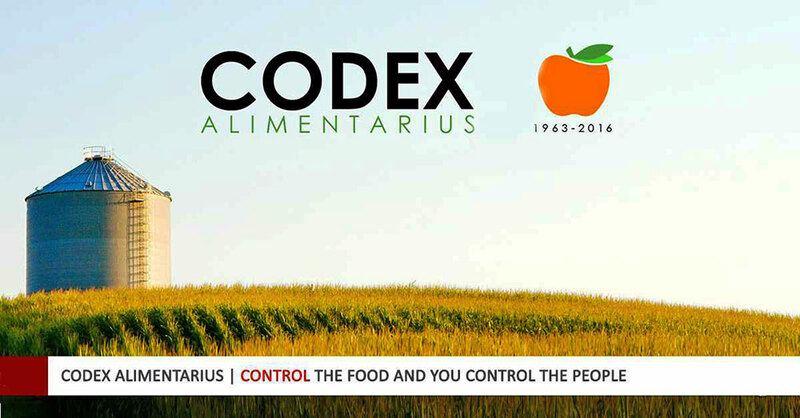 Further guidelines and standards for GM foods are now in the process of being drafted by Codex. The eventual adoption of these texts will further contribute to making the approval, and importation, of GM foods that comply with them mandatory for all WTO member countries. Crucially, therefore, the United States, Canada and Argentina are also pushing for there to be no requirement for manufacturers or exporters of GM foods to disclose the presence of genetically modified organisms on their product labeling. This, essentially, is the real key to why biotech companies are so desperate for these foods to be forced onto world markets, as the potential long-term profits are so colossal as to compare quite favorably with the market in pharmaceutical drugs. Given therefore that some of the major players in the pharmaceutical industry, such as Bayer and BASF, are also major players in the biotech industry, it can be seen that the pharmaceutical industry is once again positioning itself as a key beneficiary at Codex. 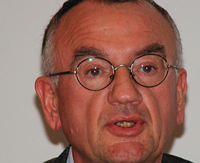 These arguments continued at the May 2006 CCFL meeting in Ottawa, where they centered around whether or not work on a definition for advertising should be initiated, and if it should, where (i.e. within which Codex text) such a definition should be placed. After considerable discussion regarding this issue CCFL decided that work on a definition for advertising should indeed be initiated. However, whilst it may be the case that some artificial additives are essentially safe when consumed in small amounts and in isolation from one another, the reality is that no substantive consideration has been given by Codex to the fact that such chemicals are consumed not in isolation, but in tandem with each other. As such, and to the benefit of their manufacturers, the cumulative long-term effect that the consumption of multiple patented chemicals and artificial additives has on the health of consumers is largely being ignored. We don't want to change. Every change is a menace to stability. That's another reason why we're so chary of applying new inventions. Every discovery in pure science is potentially subversive; even science must sometimes be treated as a possible enemy. 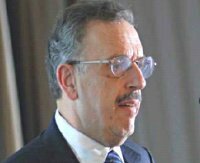 After the somewhat unfocussed and confusing discussion that followed, during which even a representative of the Codex Secretariat, Dr. Jeronimas Maskeliunas, admitted to being "completely confused" as to what the Committee was talking about, it was eventually agreed that a Working Group should meet to discuss the Global Strategy immediately prior to next year's meeting of the Committee and, after its discussions, that it should report back to the Committee. Like the World Controllers in Aldous Huxley's 'Brave New World', the Codex Alimentarius Commission doesn't want to change. From its perspective, change - in the form of a new global healthcare system based on scientific breakthroughs in the areas of vitamin research and cellular health - is a menace to the financial stability of the pharmaceutical industry. As a result, groundbreaking discoveries in nutritional therapeutics are increasingly seen as subversive and treated as an enemy to the 'business with disease'. As such, the sooner the pharmaceutical industry's 'business with disease' is confined to the dustbins of medical history, where it belongs, the better for all mankind.